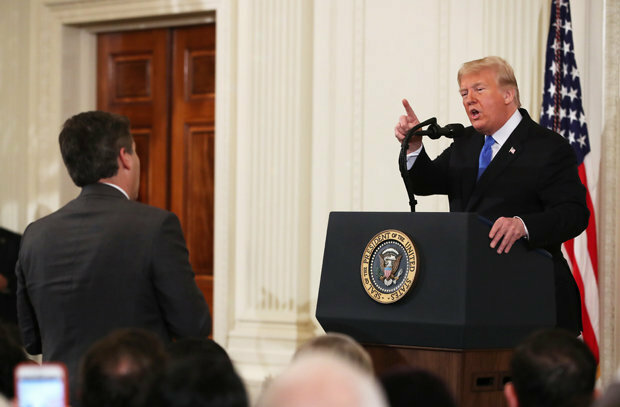 The President laid into Acosta during a heated exchange with the reporter, later banning him from the White House. We should all want a press that holds our government accountable and to ask the tough, important questions, but Acosta isn't just some "aggressive" reporter. "As of now, the money is being heavily on "Yes" for Acosta to have his credentials re-instated", Bovada.lv head oddsmaker Pat Morrow told The Washington Times in statement. "[Trump] came out right after his inauguration and said his inauguration crowds were bigger than President Obama's, when they weren't", Acosta previously said in a CNN segment. Hours after a harsh on-air confrontation between the President of the United States and Jim Acosta, the CNN reporter has been "suspended" from the White House "until further notice". But the White House appeared to suggest Acosta had laid hands on the intern. Trump's boosters used words like "pushed" and "slammed". So for them to treat this as an assault on the First Amendment is moronic. "You shouldn't be working for CNN", Trump said. The president turned away, trying to go on to another reporter, but Acosta refused to give up his microphone. We will, however, never tolerate a reporter placing his hands on a young woman just trying to do her job as a White House intern. Acosta rudely rebuffed the poor woman, moving the mic away from her as if they were playing high stakes keep-away. After asking a follow up question, Acosta let go of the mic. Acosta stood back up and noted the explosive devices that were recently sent to CNN and some of the president's political opponents. Sanders suggested Acosta had laid hands on the intern. "It's ridiculous for anyone to suggest he did". Acosta said the White House's account of the incident is "a lie". You can compare the two videos below. "This unprecedented decision is a threat to our democracy and the country deserves better", said CNN in a statement. Tinting the video red and playing it over a transparent version of the original showed, Mr Shimunov said, the clip had been "sped up to make Jim Acosta's motion look like a chop". It brings a smile on his face to see himself trending on Twitter or find himself in a glowing puff piece portraying him as some sort of hero for the free press. "We used to call it the press". The WHCA called on the White House to "immediately reverse this weak and misguided action". CNN has been most closely associated with the "fake news" slur, which the president has used constantly to undermine public confidence in the media. "As visual journalists, we know that manipulating images is manipulating truth", said Whitney Shefte, the association's president. "It's deceptive, risky and unethical", said association president Whitney Shefte. "I'm fighting back not for me, I'm fighting back for the people of this country". But that did not happen and even after the midterm elections, Trump emerged "undiminished, undaunted and unhinged: our president in full indeed".